"It's amazing, especially with my family being close. The only start they missed was the one across the border in Vancouver. And being familiar with the area, I'm a little more comfortable, not having to make a huge adjustment," he said. "It's amazing to be playing for the local team." It was not, however, the first option he was given to begin his pro career. Oakland took Olson (1-1) in the 17th round of the 2012 Draft and, with his senior season at Gonzaga looming, he opted not to sign. He wound up going 9-4 with a 2.48 ERA over 101 2/3 innings for the Zags, striking out 91 batters and walking 31 to earn West Coast Conference Pitcher of the Year honors. "I mean, this is the plan, the way I saw things working out in my favor in going back for my senior year," he said, "winning the conference, getting drafted higher, by a team that is respectable and treats players real well. I'm really happy with the decision to go back, it benefited me a lot." Through five Northwest League starts, he has a 3.54 ERA and 26 strikeouts against nine walks over 28 innings. Possessing a repertoire that includes a curveball, slider and changeup -- the pitch he cited as key to Wednesday's success -- and a fastball that runs in the upper 80s, Olson said his first impression of the pro game was how much more deliberate he had to be about pitching. "Definitely the pitchability, learning to pitch inside, because in college you got away with letting the two-seam [fastball] run outside," Olson said. "There are more intuitive hitters here and you have to work inside and then work off that with your off-speed pitches. I'm learning the game at a new level." Eugene starter Erik Cabrera matched zeros with Olson until the sixth, when Phillips Castillo delivered an RBI double and Lonnie Kauppila lifted a sacrifice fly. Everett shortstop Jack Reinheimer, a fifth-round pick out of East Carolina, went 3-for-4 to raise his average to .337 in 22 games. 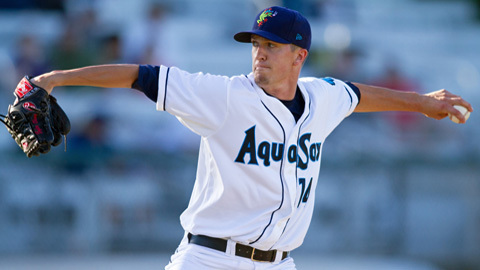 Austin Wilson, drafted 49th overall out of Stanford, doubled, walked twice and scored a run for the AquaSox.